Summer in Paris! Had such a fun time, and so many great memories. Is Singapore Better Without Foreigners? Should there only be Singaporeans in Singapore? What are your thoughts on foreigners in our work force? And should Singaporeans have a birth right – special privileges simply for being Singaporean? I hit the streets to find out. This happened quiteeee awhile back (back in 2013! ), but as I always say, better late than never! The good folks at Lenovo engaged me for the launch of their Yoga tablet this time last year (okay, really a little long, heh). She’s so statuesque – I felt dwarfed next to her! With Mediacorp makeup artist, Alvin. I was merely showing an appropriate amount of enthusiasm. Not to be misconstrued as shameless excitement or anything of the sort; no sir, not this good, Catholic girl. When I finally let him off the stage, he was probably thinking, ‘thank goodness, crazy lady!’. LOL sorry, HaoRan! Lenovo was super generous with four lucky winners walking off with a brand new Yoga tablet each! 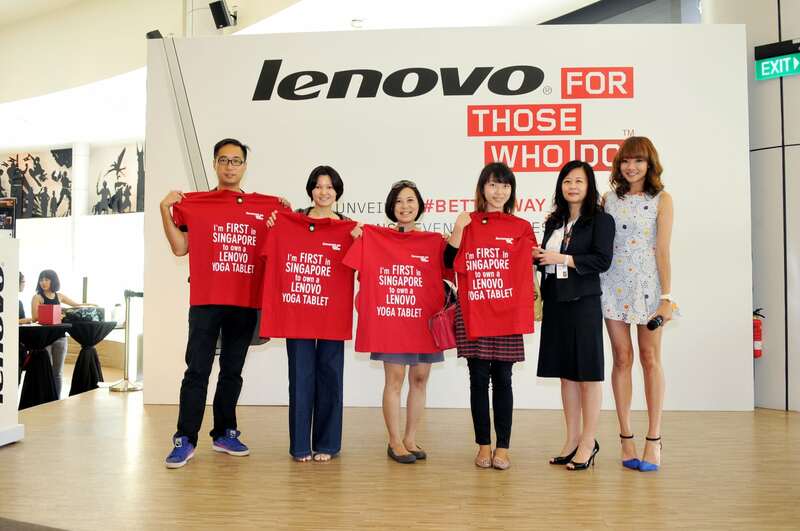 With the Muttons and the Lenovo team – thanks for having me! I’m getting married soon, and everyone’s been asking who I’m marrying, lol. There are no pictures of him on my Instagram, Facebook or this website. Maybe he’s an imaginary boyfriend? My mum was so upset that I had been skipping classes (sorry, mum!) that when she bumped into a nun who used to teach her in school, she told her about it. Long story short was that she pulled me out of that church and I started classes in another catholic church. Kids usually start and finish their entire catechism journey in one church, so joining this new bunch at 15, when everyone already knew everyone, meant I was the “new kid in school” and had to work harder to make friends. It was cool though and I was really happy in the new environment except for one thing: I remember my boy-crazy younger self complaining to a group of girls there that “there are no hot guys in this church”! One of them pointed my now-fiance out and said, “that one not bad what”. I distinctly remember saying, “ok only lah”. Haha! We never spoke even though I was a social creature who was friends with everyone. I think it was because he was… #1, really shy and hardly ever (maybe never!) spoke and #2, not in class half the time as he was then a national athlete who had training at least twice a day, six times a week. We got Confirmed at 16 (kind of like graduation) and I never saw him again. We bumped into each other more than ten years later, and I actually remembered him as his face hadn’t changed. Oh and he definitely remembered me! Heh. We chatted a little then and he followed up after that with a message. We ended up communicating a lot – without meeting for months. When we finally met, I remember it was for prawn noodles in our area (we both stay in the east) and he was REALLY quiet. I was pretty bummed and slightly confused. He had asked me out but he didn’t seem interested? He had also shared quite a lot with me prior to that but why was he so silent when we finally met? I don’t do well with mixed signals (why can’t everyone just be direct!?) and I definitely don’t take to game-playing (maybe he was trying to blow hot and cold?). I wasn’t planning to see him again. I had actually been pretty excited to meet him prior to that date and had told a friend about it. When that friend asked me how it went, I remember saying, “he was really quiet man. I think he’s not interested. I think I’m done with this one.”. This friend said maybe he was just really shy, and shy guys sometimes act like that around girls they like. He encouraged me to go out with him again. He really did ask me out again and on account of the fact that he was obviously really keen to meet me (so confusing! )…and that I thought his dimples were cute (so shoot me, I’ve my shallow, human moments!) I decided to give him a second chance and go out with him. I remember being determined to not I get excited about it as I did the last time though – I generally hate the feeling of being played like a kite and I refuse to get sucked into hot-cold spirals. It was such a fun trip, with wonderful people like stylist Steve, his assistant, Evon, photographer Winston and Sha, who made me look half-decent by doing my hair and makeup. It’s also the first shoot ever that I had my other half with me (I personally don’t believe in mixing work and play) and that made it extra special. Thank you, Her World Brides, for having us! Asked Australia-based fashion blogger, Willabelle Ong of Pale Division, all the nosy things you want to know (but don’t have the chance to ask! ); like how much she spends on shopping, where she shops and…boys (what else?)! Special thanks to Willabelle for being a sport! Check out her blog and see how she fared in a trash bag challenge – yes, she literally wore a trash bag! – here! The clothes you wear are a reflection of your personality.Get tips from styleXstyle fashionistas on how be casual and stylish at the same time.